Samuel Grimm (1733 - 1794) was a Swiss artist who worked for the Rector of Kirkby-in-Ashfield, Richard Kaye (1736 - 1809), drawing many pictures in the county in the second half of the 18th Century. The collection is now in the British Library, but can be accessed and seen in detail at www.bl.uk/onlinegallery. 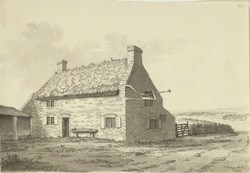 On a trip north in 1792, Grimm made the picture shown, previously only identified as 'The Plough Inn, Sherwood Forest'. (Note the actual plough hanging up by way of an innsign). 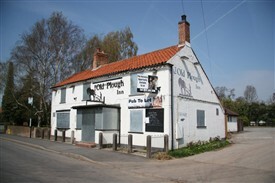 Sadly this is clearly The Old Plough Inn at Egmanton which has recently ceased trading and faces an uncertain future. That has been the fate of thousands of public houses, many of them historic, which have closed down during the last few years. If that was because people were drinking less alcohol, then it might be no bad thing. Yet such is clearly not the case; on the contrary there has been a consistent rise in alcohol-related illness (and crime). The reasons for this shocking turn of events are both political and social. The tragedy is that alcohol is now so cheap and easy to pick up from supermarkets that it is being consumed in the home on a much larger scale than ever in the past. At the same time pubs - traditionally a place for men to drink and smoke in away from their wives and children - were made to become 'family-friendly', welcoming everybody in. This reduced them to restaurants, a market in which they could never seriously compete on the same terms as eating establishments that already existed. The ban on smoking (half the original purpose of a public house) in all public buildings was the final straw. When Grimm did his picture of it The Plough had most likely already been in business for at least a hundred years. It survived for over two centuries more, only to perish recently. One wonders what future ages will think of today's casual lack of concern for the things that matter from the Past? This page was added by Ralph Lloyd-Jones on 20/10/2011. I think another factor in the decline of pubs is we have lived through a period of de-industrialisation over recent decades and in some instances the pub, with its traditional social activities, is more associated with our industrial past. There is also an economic factor as traditional relatively well paid jobs, especially in male employment, were replaced by the less well paid "mac-jobs" of today. GOOD NEWS: It reopened in 2014, so let's hope The Old Plough flourishes for another half-a-millenium or so! Blessed beer - did holy water start Kimberley brewery?